Blood Cell Biochemistry was initially conceived as part of the Plenum series Subcellular Biochemistry, from which it has developed into a separate series. 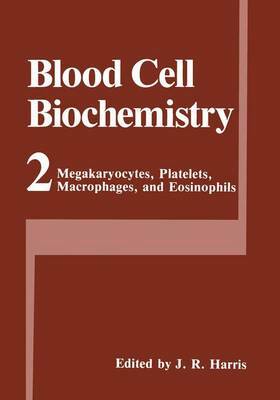 The present volume is devoted primarily to contributions on megakaryocytes and platelets and, to a lesser extent, to macrophages and eosinophils. The book does not attempt a rigorous or total coverage of the particular topics; it represents the areas of current scientific activity and interest that were selected by the editor at the commencement of this project. In general, the approach has been similar to that adopted for Volume 1 of the series (Erythroid Cells); the same approach will be followed subsequently in Volume 3 (Lymphocytes and Granulocytes). This book opens with a developmentally oriented chapter by Janine Breton-Gorius on megakaryocyte maturation and platelet release in normal conditions, which serves to set the scene ultrastructurally for much of the data that follow. The biosynthesis and process- ing of platelet glycoproteins in megakaryocytes is dealt with by Alain Duperray and his colleagues, and thereby provides an in-depth biochemical survey of the megakaryocyte. The applications and strengths of crossed immunoelectrophoresis for the study of platelet membrane proteins is then covered by Simon Karpatkin, and a detailed account of the heredity disorders of platelet function is provided by Francine Rendu and Evelyne Dupuy.